Since this is my first quilt project ever, I decided not to spend a lot of money on fabric. A yard of fabric at a craft store is at least $7; meanwhile, I can pick up a set of three sheets for no more than $10 at Goodwill. And those three sheets will be more than enough for the majority of the quilt. I may need a couple pillowcases or another sheet eventually, but those are easy enough to pick up. Learning how to assemble a quilt has been eye-opening. On some level, I recognized that quilting is a project. However the realization of having to cut HOW MANY squares and all the measuring and probably getting stabbed with LOTS of pins hit me hard. I’m still going to make this quilt. I’m actually glad that I know how much work will be involved, so I won’t become disheartened when I’m not making progress as quickly as I’d like. Everything seemed to be progressing apace. I even pulled the sewing machine off the shelf in my closet, chiseled the Styrofoam off it, and poured over the instructions (which made close to no sense). A couple YouTube videos later, and I successfully threaded the needle and the bobbin. I even used it to sew a pair of rice-filled ice packs. Then I decided to make a pair of handkerchiefs. I pinned the seams in place rather than iron them flat, and the needle on the machine hit the head of a pin and that little plastic pinhead bent the needle. I’m still not even sure how plastic won i that battle. I replaced the needle but couldn’t pick up the bobbin thread. So the sewing machine is sitting in my living room until I have the time to re-thread the machine with hopefully better thread tension (because I heard that might fix it?). Until I figure that out, this project isn’t exactly on hold. I can still measure and cut fabric squares; I can figure out how the pattern should look. The pause button has just been hit on assembling everything. So. I went to Lowes a few weeks ago. I came home with four cinder blocks, two halves of an 8-foot board, a bird-feeder hook, and bamboo. The thing was that I didn’t plan on buying anything when I wandered into the store. In fact, heading to Lowes wasn’t even on my agenda for the day when I left the apartment. It was just supposed to be a quick trip out of my apartment for a new clock to replace the one that’d fallen off my wall. Ever since I was bitten by the DIY-bug, there’s an outdoor shelf that I’ve wanted to build for a while. It’s an easy project. No tools needed, just a bit of paint. And my brain decided that today was the day for that project to get done. I have no idea why. I long ago gave up trying to figure out how my mind works. 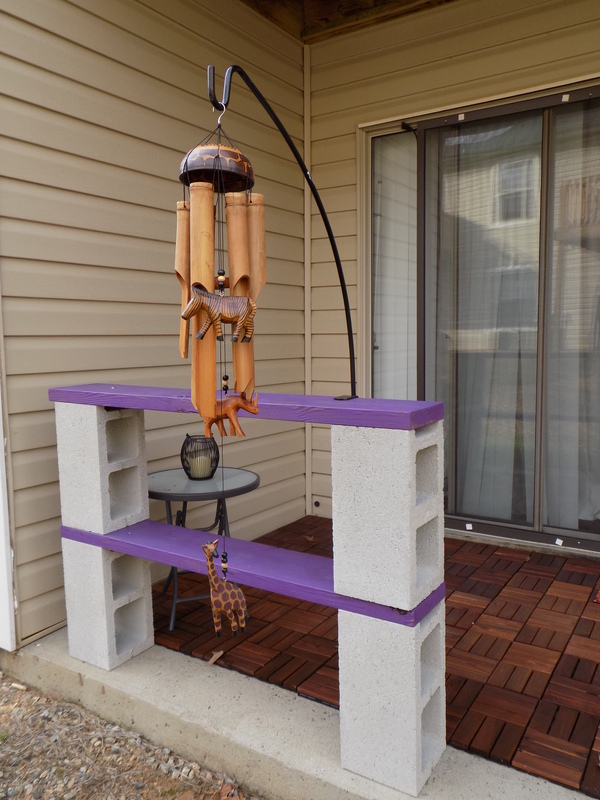 So I bought all the supplies I needed for the shelf, a bird-feeder hook to hang my wind-chimes, and a stalk of bamboo. The shelf has been assembled, and the bamboo has found its new home. I’ve named her Sophia, by the way. What’s the moral of this story? I should not be allowed into Lowes on my own when there are DIY projects dancing around in my head.